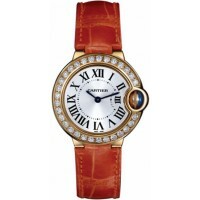 Cartier was founded in 1874 and is known for producing some of the most intricately designed movements and lavishly styled men's and women's watches in existence. 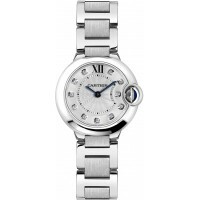 Often seen on the wrists of royalty, celebrities, and politicians, Cartier's watches are sure to catch the eyes of everyone you come in contact with. 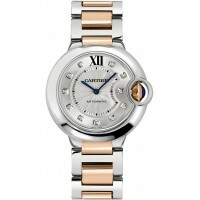 Cartier often creates unique case shapes and pull inspiration from their travels in order to accurately represent everyone's styles. 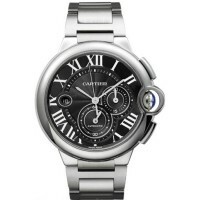 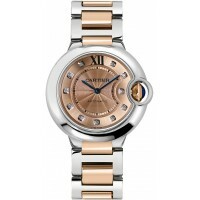 You will find some of Cartier's most renowned men's and women's watch collections, such as the Tank, the Ballon Bleu, the Roadster, and the Santos on MadinaJewelry.com. 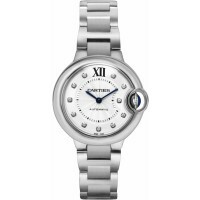 When you buy a Cartier watch from MadinaJewelry. 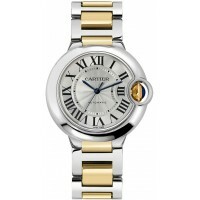 com you'll be getting exclusive sale prices and own a watch that is coveted worldwide. 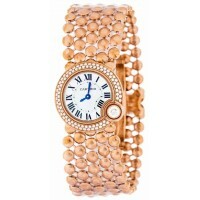 This feminine jewelry watch offers a fresh twist on the original design. 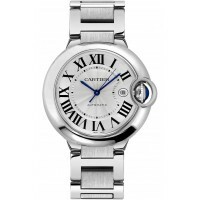 The piece is set off by the..
Cartier Ballon Bleu W3BB0018 - Swiss Made , Lacquered Sunray Silver Dial Set with Di..
Cartier Ballon Bleu WE900151 - Swiss Made, Roman Numeral Opaline Silver Dial, D..
Cartier Ballon Bleu 18k Gold & Steel Diamond Watch WE902054 - Swiss Made, Flinque Rose Gold Dial..
Cartier Ballon Bleu Black Dial Chronograph Men's Watch W6920025 - Swiss Made, Black Dial&n..
Cartier Ballon Bleu Guilloche Silver Dial Men's Dress Watch W69012Z4, Swiss Made, Guilloche Silver D..
Cartier Ballon Bleu Ladies Gold & Steel Watch W2BB0012 -Swiss Made, Guilloche Opaline..
Cartier Ballon Bleu Silver & Diamond Dial Women's Watch WE902073 - Swiss Made , Flinqu..
Cartier Ballon Bleu Steel Diamond Women's Watch WE902074 - Swiss Made, Opaline Silver Dial Set..